What is Natural Grooves? It’s all about live, acoustic drums and nothing else. Natural Grooves gives you complete control over an arsenal of pure acoustic grooves. for a mix of blues, blues-rock, rock, pop-rock, Southern Rock styles. Over 1200 clean, dry, unprocessed drums and samples. Keep it natural with Natural Grooves! There is something to be said about the pure beauty live acoustic drums that are allowed to ring out in a warm, controlled recording space. While the competition continues to smother layer upon layer of compression to their drum loops (not to mention heavy-handed EQ and reverb as well), Beta Monkey’s Natural Grooves® delivers 100% live acoustic drum loops with an honest and simple mix. These are the way drums are recorded when you just want the pure acoustic sounds of the drum kit. Just balance the faders, adjust the panning, and let the drums sing. It’s a blank slate in terms of acoustics, giving you plenty of headroom to dial in the mix the way you want (or, of course, leave it as is!). Want total control over your drum sounds? Want the ability to add the effects, compression, and reverb YOUR music needs and not the other way around? 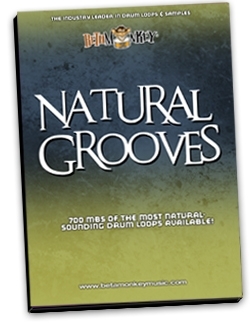 With over 1200 drums and samples, Natural Grooves gives you complete control over an arsenal of pure acoustic grooves. Bottom Line? The Natural Grooves drum collection offers the artist complete control over the sound of the drums. 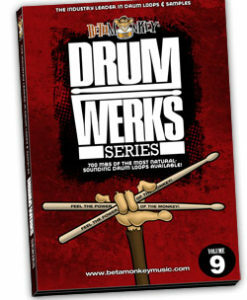 It’s simply a collection of live acoustic drum loops in a few essential musical styles. Covering drumming styles including blues, blues-rock, rock, pop-rock, and a bit of Southern Rock, Natural Grooves covers a wide range of drum beats, all equally at home in any project needed raw, live drums. A versatile and useful collection of grooves for anyone needing that pure and honest sound of acoustic drums. Full Range of Rock, Pop, Blues-Based Acoustic Drum Loops: Pure, natural grooves for writers looking for that true acoustic sound. The drums are untreated, just a true focus on capturing how the drums actually sound in the room. A good mix of feels and tempos, Natural Grooves is good for any artist looking for the true sound of drums. Natural Acoustic Drum Mix – No heavy-handed EQ or compression. It’s the sound you expect to hear from live drums. Perfect for earthly, organic styles of music where a hyper-processed drum mix is not what you’re after. The Finishing Touches/One Shots: We also included cymbal swells, ending ritards, and more. 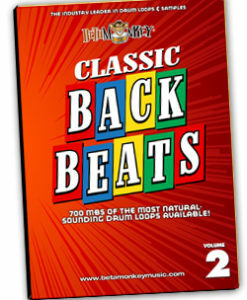 All the “little” things most drum loop libraries don’t include, but are vital to realistic drum tracks. Available for instant digital download and DVD with all formats — ACIDized WAV, APPLE, and REX2 formats — included with purchase. *Total files includes all main grooves, groove variations, fills (intro, transition, and outro), and one shots.